Reggie Rolle, who established the Dominica Association of Persons with Disabilities (DAPD) 35 years ago, was as troublesome as a baby cat, as tough as the skin of a dry coconut, as soft as tears, as know-it-all as a professor of… everything. That's how Kathy Robinson described her late uncle at a media launch of the DAPD's anniversary commemoration last week at the DAPD headquarters in Goodwill. "Reggie always knew everything," she said in a tone that indicated that she loved and admired her physically challenged uncle. "He was persistent to the point of being intolerable. He was mischievous, troublesome and a tease. He could not be ignored. He could get under your skin much to the chagrin of government officials and politicians in government who probably said yes to Reggie to get some peace." Robinson continued: "We have always been proud of Reggie and he knew it. Reggie ensured that it was understood that disability was not inability." According to the DAPD, 2018 marks an important year for the association that Rolle founded on October 26, 1983 to change the status quo and to give a voice to persons with disabilities. 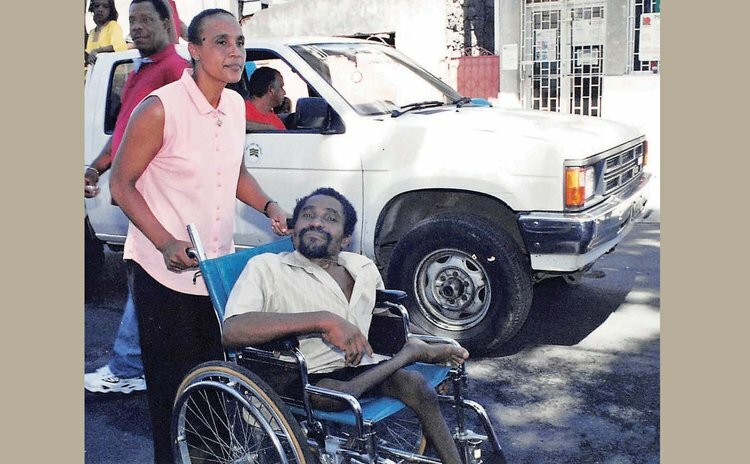 "In observance of our 35th Anniversary, we found it fitting, worthy and necessary to pay homage to the founder of the disability movement in Dominica," said DAPD president, Irma Raymond Joseph. "Our anniversary theme: "DAPD 35 and Still Alive, Remembering Reginald Rolle the Trail Blazer". Raymond-Joseph continued: "When the late Reginald Rolle returned to Dominica from Barbados in the summer of 1983 with the herculean task of establishing a national cross-disability, self-help consumer movement, hardly would he have foreseen how this would have impacted the lives of so many, thirty-five years later. "By the last quarter of the year, he had convinced sufficient persons that such a movement was necessary and important, and on Thursday October 26, 1983, a group of persons with and without disabilities gathered at the Workshop for the Blind in Goodwill and agreed to the formation of the Dominica Association of Disabled People (DADP). Among them were, the Manager of the Workshop for the Blind, Mrs. Alberta Christian, Roman Catholic Priest, Rev. Fr. Eustace Thomas, VSO attached to the Youth Development Division, Tony Kerwin, and persons with disabilities, Sylvanie Prosper, Nathalie Giraudel, Pauletta Prosper, Augustine Languedoc Rosemund Christopher, Eraline Bastien and Joseph Gabriel. A Steering Committee was formed with Reginald Rolle at the helm". "While Reggie, as he was affectionately called, was firm in his conviction and passionate in endeavours, he encountered much opposition and disdain by those who had found him to be "too aggressive, too outspoken, too bold and too forthright, hence becoming a very controversial figure. He however remained firm, determined, strong-willed, and focused in his desire to see the creation of a Dominica where persons with disabilities would no longer be treated as second class citizens but enjoy all the rights, opportunities and status as any other citizen. "For twenty years, he championed the cause of persons with disabilities nationally, regionally an internationally. His awareness raising and consistent advocacy enabled many persons with disabilities to become empowered, grow in confidence, acquire a greater level of self-esteem, an change the perception, mentality, attitude and treatment of many whom we refer to as, ''non-disabled" towards these individuals. "As we commemorate our 35th Anniversary, we pay tribute to this disability icon and Trail Blazer to whom we owe so much, for the strides, progress and advancement that we, as persons with disabilities have realized. "We know that you are rejoicing to know that: Your mission and vision did not die when you left us to return to your maker on Saturday June 14, 2003". In a message via Skype former President Michael Murphy reiterated a call that he made five years ago for the Government to posthumously honour Rolle with a meritorious service award.